1012: Mind Trip - Twokinds - 15 Years on the Net! Natani: (in Keidran) Seriously, Zen. How are you feeling? Zen: (in Keidran) I’m fine… What about you? Look at your hair. There’s a… chunk missing. When did that happen? Looks funny. Raine: (in Keidran) W-wait! I don’t know how your mind thing works, but I don’t think you should do that! 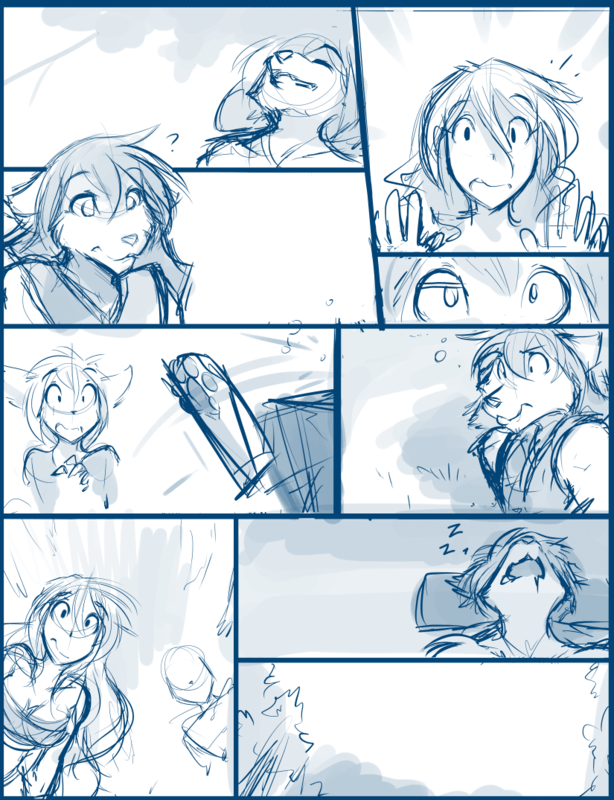 Natani: (in Keidran) Why is everything suddenly… floating… Uuurgh~ah! Keith: (in Keidran) Stop collapsing constantly! You’re going to give me a heart attack! Natani: (in Keidran) I didn’t mean to. Yeesh! What was that?! Raine: (in Keidran) Sorry, sorry! I tried to warn you. I didn’t know what else to do for his pain, so… I just gave him all the herbs I could. Raine: It… was a lot. Raine: (in Keidran) Oh. There he goes. Again. Natani: (in Keidran) Well, let’s get him moved. Raine: (in Keidran) Ah, ok. Carefully. I’m Raine, by the way. I do hope that dragon is safer on the next landing, for Zen’s sake. Natani: (in Keidran) No, no, no dragon. We’re taking a more direct way back. I hope.